Axio is a boutique graphic design and branding agency based in Colorado Springs, Colorado. Our clients come from a wide range of businesses and organizations in various parts of the U.S. We serve our clients — their vision, their mission, their budget. And we bring high-level creative solutions and our 'A' game to every project. Ask our clients 'why Axio?' and you'll hear a variety of replies. (remember this before you sit next to us at ballgames or parties). We are highly committed (in a way that says we care about this as much as you do — seriously). We are passionate advocates of brand excellence (yes, our clients really do call us to ask if something is within guidelines before they make a move). Talent and that 'always striving for excellence thing' are part of our DNA. We pledge to keep the pencil sharp — for you and for each other. It's how we're wired. Mun Choi is simply the best in the business. Inspired posters, time tested logos, ads that move the needle, innovative electronic media, environmental graphics extraordinaire — he has designed for excellence in all mediums. That kind of talent often comes with a big, giant ego but that is not the case with Mun. He is the standard for what service should be. He is a great leader, great teacher, and gifted graphic designer. All that said, do not try to keep up with him at lunch time. He typically puts away an impressive portion that could feed a family of five. Small price to pay to keep this guy fueled for greatness. Mun has been the agency's creative compass for over 15 years. He is also majority partner. He leads Axio's creative efforts with the highest standard of excellence, from strategy to production. His award-winning work is only surpassed by his ability to mentor other talent. Mun is well-known in the design community for his creative designs, innovative solutions, his commitment to high standards, and his client-centered attitude. Mun's love of design, the art of concepting, and very cool paper is obvious. Pictured are his origami golden dragon and basket, as well as his ode to the local food trucks (or simply trux as they are known to all Axioites). Also pictured are his favorite fly fishing rod & reel, and killer collection of flies. These images may appear diverse but if asked, Mun will tell you the dragon and basket make him think of having Chinese food. The trux and fishing are even more obvious connections to eating. We see a pattern here. Julie is passionate about delivering both excellent creative and excellent service. One without the other just won't fly in her book. She loves developing strategic solutions, loves helping clients succeed in their marketplace, and loves the fast pace of running a highly successful boutique graphic design firm. 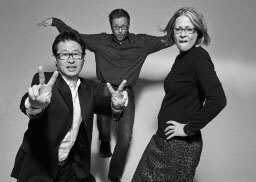 She'll tell you she couldn't do it without business partner Mun Choi and her talented colleagues. She'll also tell you that online shopping is not only convenient but highly therapeutic. Close bonds have formed with both UPS and USPS delivery peeps — holiday gifts for each are a given. Julie is the agency's creative director, as well as a partner in the company. She has been the driving force behind Axio's foundation of brand worthy creative and client-centered process. Though Axio's client base is quite diverse, one common thread found throughout all projects and campaigns is a strategic foundation thanks to Julie's leadership. Prior to moving to Colorado, she was the director of member services with a national trade association in Washington, DC, overseeing the research efforts, demographic data mining, conference marketing, and membership development for the organization. Prior to that role, she served as an account executive for a communications and design agency. It all started with the tall go-go boots in elementary school and it's been a lovefest ever since. Short ones, tall ones, cowboy and riding — she truly loves them all. Pictured are some members of the growing collection. Julie also has a life-long love of animals and is called the lion tamer by a few insiders. Joey's eye for great creative is just one of the stellar qualities he embodies. With his design background, he guides projects with precision. He is a watchful brand manager and killer proofreader. And in the midst of work flow that sometimes feels like a Tsunami, Joey takes it all in stride. He is a sports enthusiast and comic book aficionado, and holds many a nickname at Axio from Wheels, to the G man. Joey brings great talent to the management team at Axio. Though Joey has several years under his belt as a graphic designer, his role as client services manager at Axio is a natural fit. The unique combination of high-level technical understanding and visual perspective makes working with Joey a great thing for Axio's clients. As with most small businesses, he wears many hats — from guiding art direction to overseeing client billing, from assisting in production to the all-important lunch fetching for the rest of the crew. This Indiana native or "Hoosier" as they're more commonly known, most recently worked at a planned giving marketing firm in Indianapolis before making the move to the Colorado in 2010. From Spider-Man to the Incredible Hulk, Joey is a super hero aficionado extraordinaire. In film, print, or figurines, he continues to celebrate this passion well into "adulthood." Pictured are a few samples of his vintage comic book collection. He is a loyal Colts fan and an avid runner. You may see Joey sporting his sweet new Vibram fivefinger kicks — he is a full convert to these over traditional running shoes.